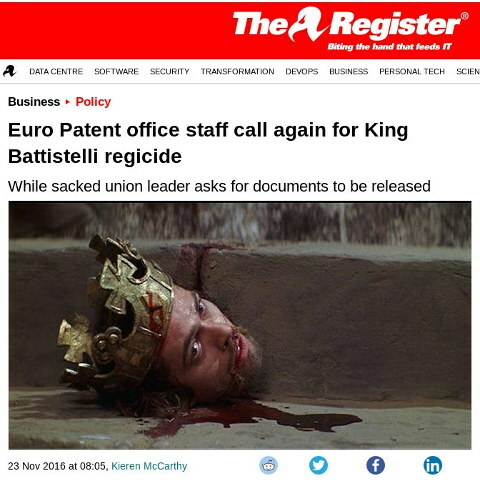 The central staff committee at the European Patent Office (EPO) has asked again for the organization’s Administrative Council to take action against its president Benoit Battistelli, citing the dismissal of the secretary of its staff union as the final straw. The firing of Laurent Prunier after more than a year of disciplinary proceedings has set off a firestorm of frustration with EPO management. Staff protests at EPO offices have been joined by national politicians and the Dutch government is due to hold a special debate on the matter. Even the staunchly neutral trade press seems to have had enough, with editor of Intellectual Asset Magazine (IAM), Joff Wild, writing a damning article urging the EPO’s Administrative Council to “get a grip of this situation” and wondering out loud whether he had been wrong to give EPO management the benefit of the doubt. Meanwhile Battistelli – whom we have dubbed King Battistelli due to his persistent belief that he is above both national laws and his own organization’s independent review boards – is unrepentant, and continues to claim that his targeting of staff that have opposed his reforms is a result of their own actions. A protest/demonstration is just 24 hours away. Please take photos of the demonstration and send these to us (we’ll protect anonymity of senders and those pictured, as usual). On 4 November Mr Battistelli, President of the European Patent Office, dismissed Laurent Prunier, elected member of the Central Staff Committee and Secretary of SUEPO The Hague, against the will of the Administrative Council as expressed in its March 2016 Resolution. In 2016, Mr Battistelli dismissed three elected Staff representatives and SUEPO officials and downgraded another one, a first in the world of International Organisations. Other investigations/disciplinary proceedings concerning SUEPO officials are ongoing. On 24 November we will demonstrate our solidarity to Laurent and other dismissed / downgraded / targeted Staff Reps and SUEPO officials. We will gather at the “Plein 1813″ at 12:00 and march to the “Lange Vijverberg”, in front of the Office of the Dutch Prime Minister.